Preheat oven to 400 degrees F. Make a bacon weave: On a baking sheet, line 3 bacon halves side-by-side on the pan. Lift one end of the middle bacon slice and place a fourth bacon half on top of the side pieces and underneath the middle slice. Lay the middle slice back down. Next, lift the two side strips of bacon and place a 5th bacon half on top of the middle piece and underneath the sides. Lay the side slices back down. Finally, lift the other end of the middle slice and place a 6th slice on top of the side pieces and underneath the middle slice. Repeat the weaving process 4 times. Season bacon weaves with pepper. Place an oven-safe cooling rack on top of the bacon (to prevent curling) and bake until bacon is crispy about 20 minutes. Transfer bacon weaves to a paper towel-lined plate. Slice tomatoes and reserve inside tomato slices for other uses. 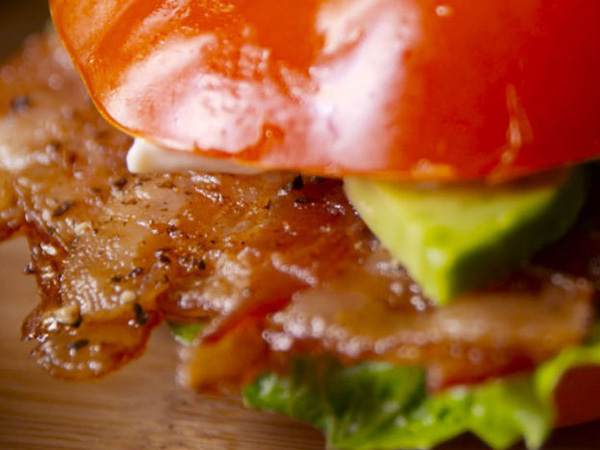 To make the sandwich, top the bottom slice of a tomato with romaine, bacon weave, and avocado. Slather top tomato slice with mayo and top on sandwich.